The third week in February at Hilton Pond Center was quite different from wintry days during the month's first fortnight, when snow blanketed the landscape with white and big numbers of ravenous birds sought sustenance from our well-stocked feeders. Snow melted quickly this week as temperatures rose into the upper 60s and even the low 70s, reminding us that Hilton Pond Harry--the Peromyscus Prognosticator, was almost surely right in disagreeing with groundhog weatherman Punxsutawney Phil in forecasting spring as just around the corner. Across our pond, loud and repetitive calls of "tea-kettle, tea-kettle, tea-kettle" and "peter, peter, peter" from the throats of Carolina Wrens and Eastern Tufted Titmice certainly made it SOUND like spring, with further evidence coming from a dozen or more Painted Turtles basking in warm February sun. We even saw some insect activity: Carpenter Ants crawling about on tree trunks and a Green Stink Bug ambling along our new Observation/Teaching deck (in its final phases of re-installation behind the Center's old farmhouse). With all this in mind--and with lots of winter finches finally crossing our banding table--it was with mixed feelings we departed Hilton Pond on 25 February for our first-ever trip to Honduras. More than a year ago Debbie Sturdivant Jordan (our hard-working trip coordinator with Holbrook Travel) talked with James Adams (a U.S. citizen who now lives and works in Honduras) about possibility of an Operation RubyThroat scouting trip based out of the Lodge at Pico Bonito near the Honduras Caribbean coast (see map above). James works there as a naturalist and manager. We explained to James via e-mail we needed a population of wintering Ruby-throated Hummingbirds in Honduras if we were to bring a group of citizen scientists for an ORT trip; in response he consulted birding guides on his staff and learned there were at least a few RTHU in the vicinity of the Lodge and at another nearby facility at Rio Santiago. To demonstrate his interest in future hummingbird expeditions to Honduras, James graciously offered to host ORT's "Omega Group" (i.e., principal investigator Dr. Bill Hilton Jr. and long-time colleague and guide Ernesto M. Carman) for nine days at the Lodge at Pico Bonito--and to provide an expert guide who would help us locate ruby-throats and show us other birding opportunities in which an ORT group might participate. 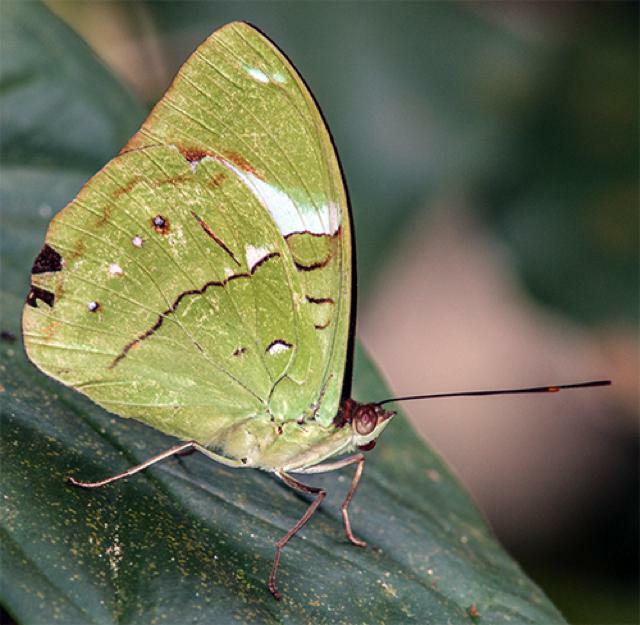 It's not often we get such a generous offer, so we quickly accepted and added a Honduras leg to precede our eight-day trip scheduled for Belize in March 2014. 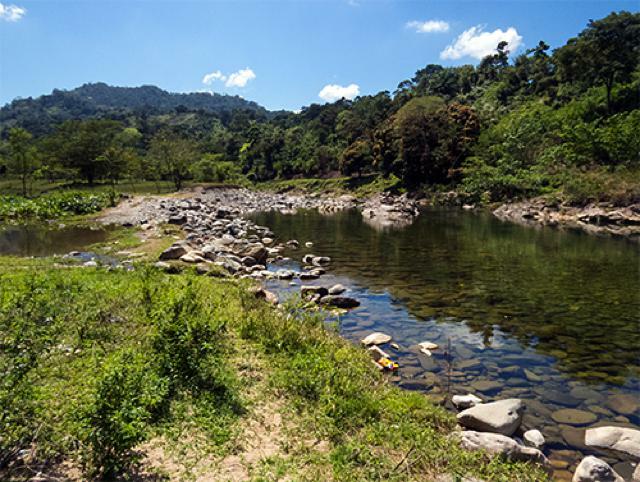 The photo essay below summarizes our first four days at Pico Bonito; next week's installment of "This week at Hilton Pond" will describe the second segment of our Honduras stay. 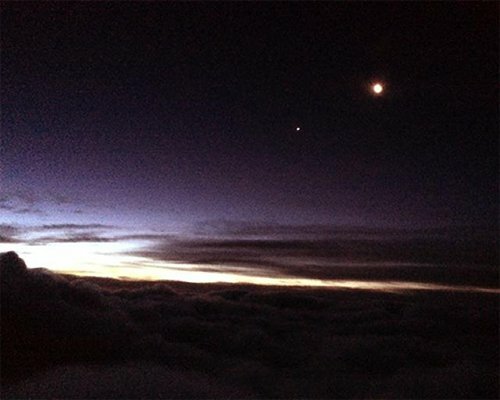 Well before dawn on 25 February, trip leader Bill Hilton Jr. departed Hilton Pond Center for his 5:50 a.m. flight out of Charlotte toward Miami (iPhone image of pre-dawn Moon and Venus, above)-- followed by a five-hour layover before a second leg and eventual arrival at San Pedro Sula's airport in Honduras. Ernesto Carman had a more leisurely first-class non-stop out of San Jose, Costa Rica, and got to to Honduras about a half-hour before Hilton taxied in. We were met by Esdras Lopez (right), a guide assigned by the Lodge at Pico Bonito and whom we got to know very well during our stay. 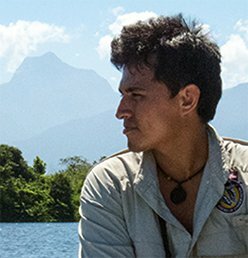 Esdras, a 20-year-old Catracho (native-born Honduran), is already an accomplished English-speaking nature guide and freely shared his expert knowledge of birds of the area. 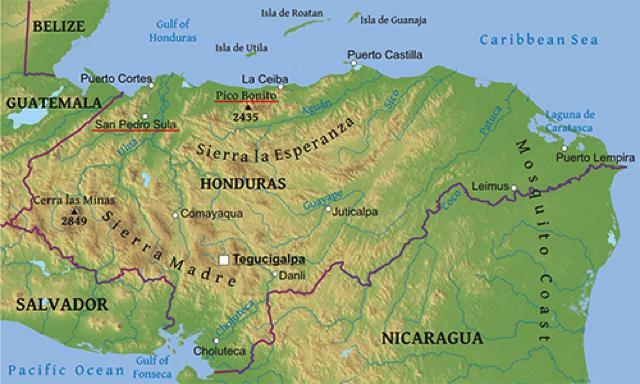 We learned Esdras is proud to be a Lenca, an indigenous people who settled Honduras long before the Mayans. 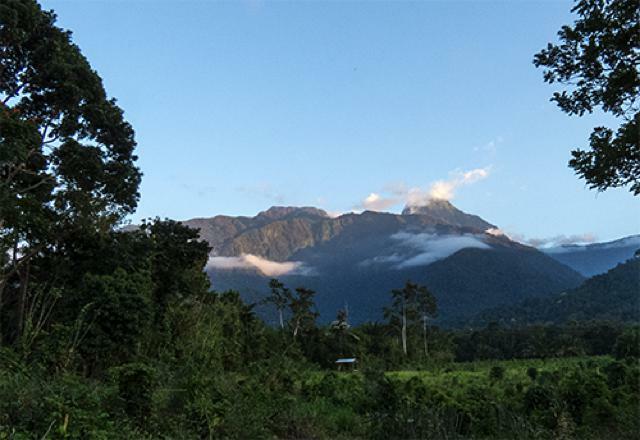 During our 2.5-hour ride from the airport to the Lodge, the Omega Group had ample opportunity for ever-closer views of Pico Bonito (above)--the "Beautiful Peak" whose name is applied to a 218-square-mile reserve established less than 30 years ago in 1987. Although designated a national park, the reserve is administered by a non-profit non-governmental organization. 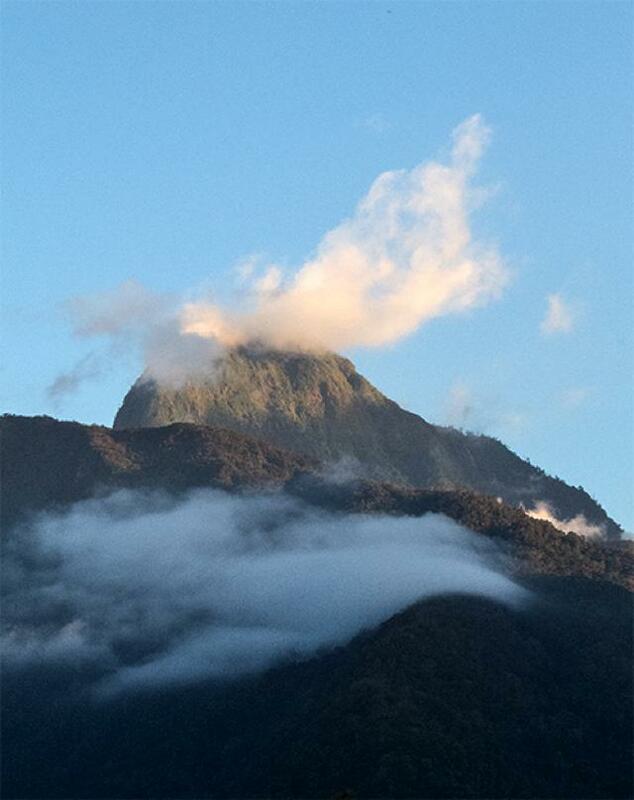 At nearly 8,000 feet, Pico Bonito dominates the north coast of Honduras and provides a highly visible landmark. Since the range arises so close to the Caribbean shore, rapid altitudinal change yields diverse habitat from low-lying tropical rain forest to high-elevation cloud forest, with the rain shadow causing a very dry tropical forest on the park's south slope. 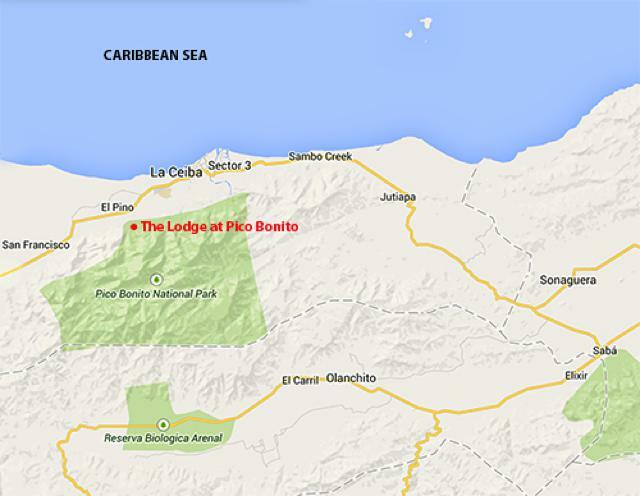 The Lodge at Pico Bonito (see map)--near La Ceiba and just south of the small town of El Pino--comprises a 400-acre tract at the north edge of the national park, at an elevation of about 350 feet. 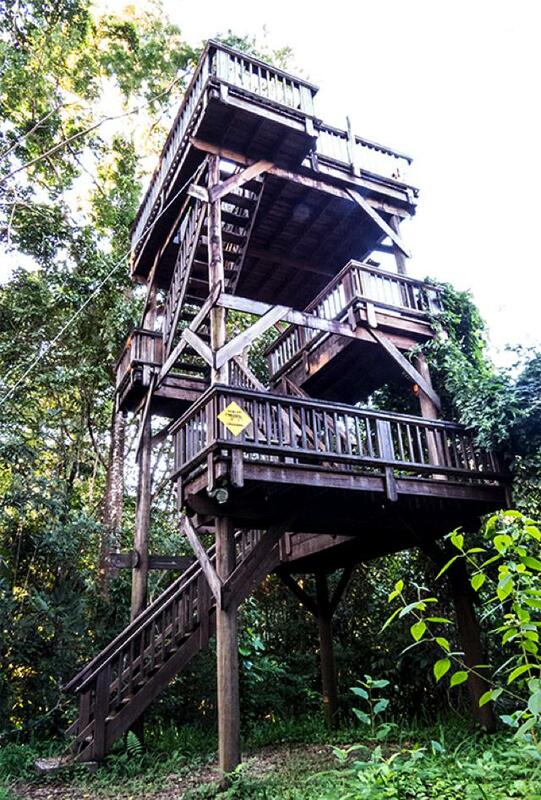 Accessible by a gravel road ten minutes up the mountain, the Lodge specializes in nature-related activities and hosts birders from around the world. 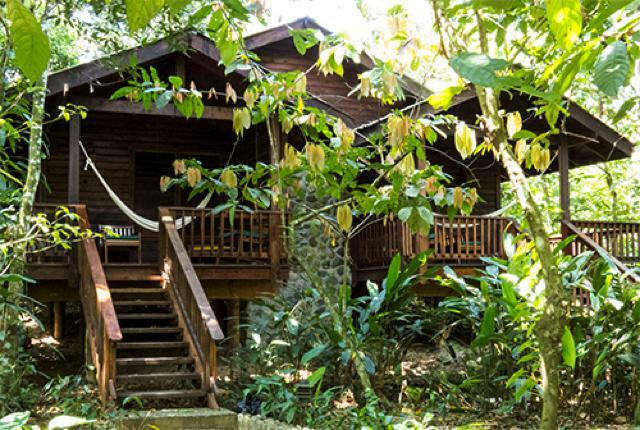 The property includes well-appointed single and duplex cabins (above) with comfortable beds, hot showers, and optional air conditioning; a top-quality restaurant; a gift shop; a pool; a small nature library; conference rooms; and more than two miles of trails that meander through the tropical forest. The entry path to the reception area is lined with trees bearing showy orchids such as Shower of Gold, Oncidium sp. (above). 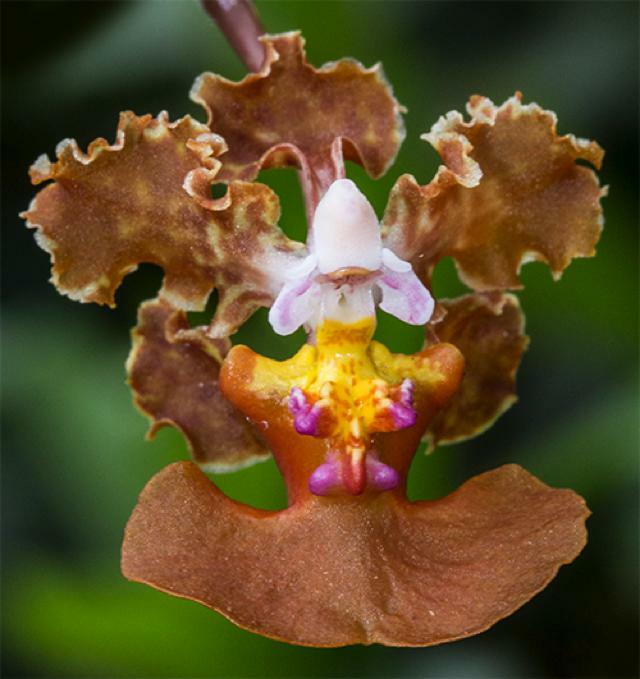 Orchids abound in Honduras and delight the eye at every turn. Our view of welcoming orchids was quickly diverted by our first bird at the Lodge--a Red-billed Pigeon, Columba flavirostris (above), perched above the reception building. 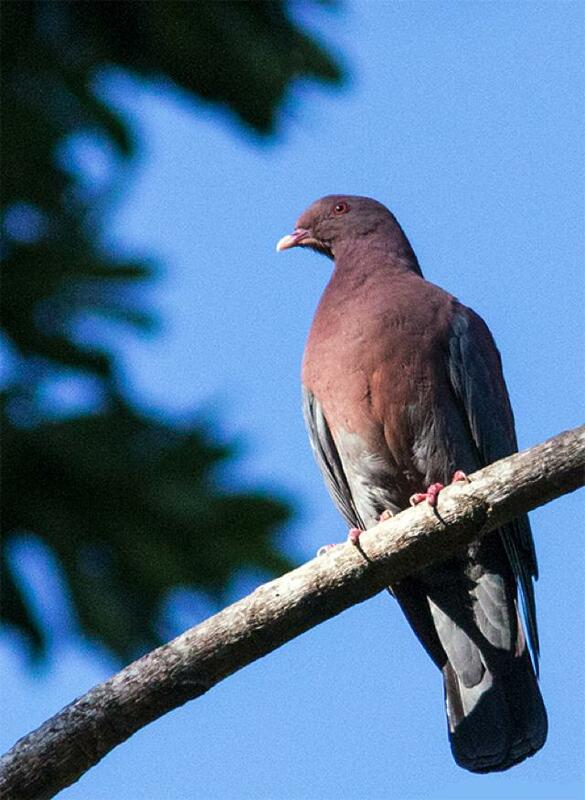 This is one of at least a dozen members of the Dove & Pigeon Family that can be seen easily around Pico Bonito. Also highly visible were numerous hummingbirds that come to perhaps 20 sugar water feeders kept fresh by Lodge personnel. 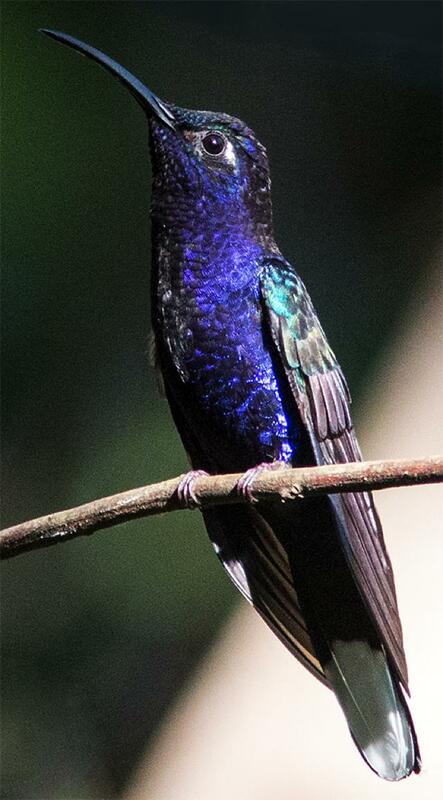 Most obvious right off the bat were big Violet Sabrewings (male above), White-necked Jacobins, and Long-billed Hermits, although we were careful to look at other smaller hummers in the hope of spotting our sought after Ruby-throated Hummingbirds. 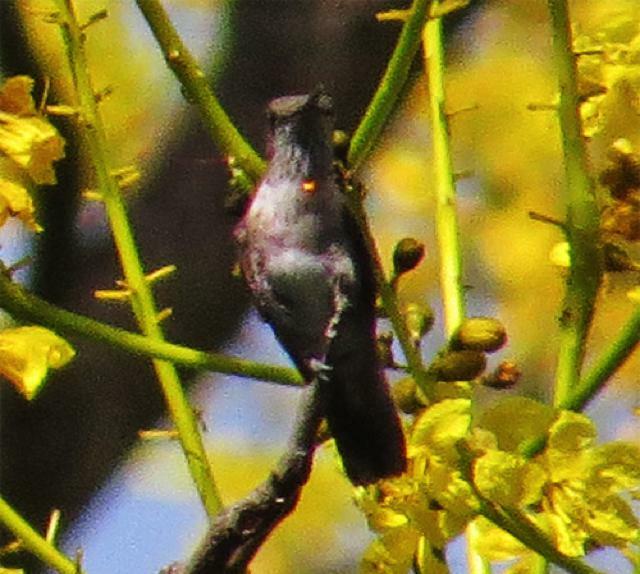 Alas, the "little" hummingbirds were all Crowned Woodnymphs. The meal was a delightful offering of fresh seafood from nearby fishing areas, served by energetic and friendly waiters who spoke very good English and satisfied our gustatorial needs with humor. With full bellies, we wandered off to our respective cabins, pausing to examine tracks in some mud. 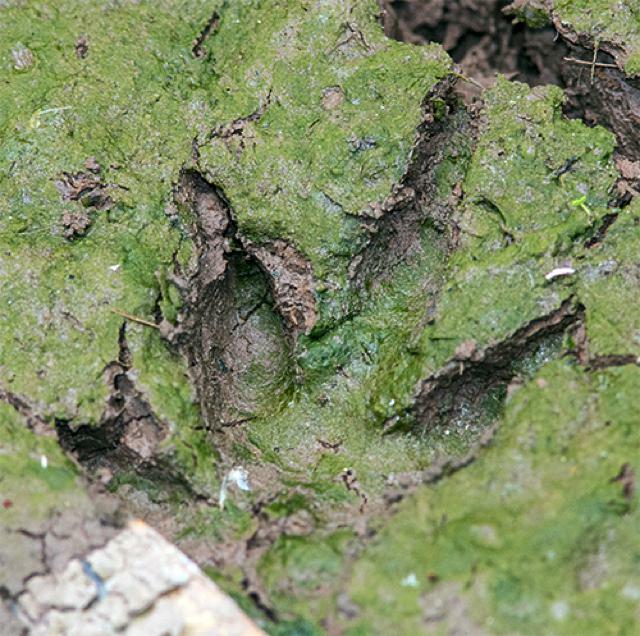 Well-defined digits tipped with heavy claws made us suspect the print above to be that of an Agouti's three-toed hindpaw. Sure enough, on the trail to the cabins we found a herd/flock/covey of Agoutis, Dasyprocta sp. (above), foraging and feeding in the waning light. Several species of these long-legged relatives of Guinea Pigs occur across the New World Tropics, where they are semi-colonial and often feed together in groups like the one we saw. 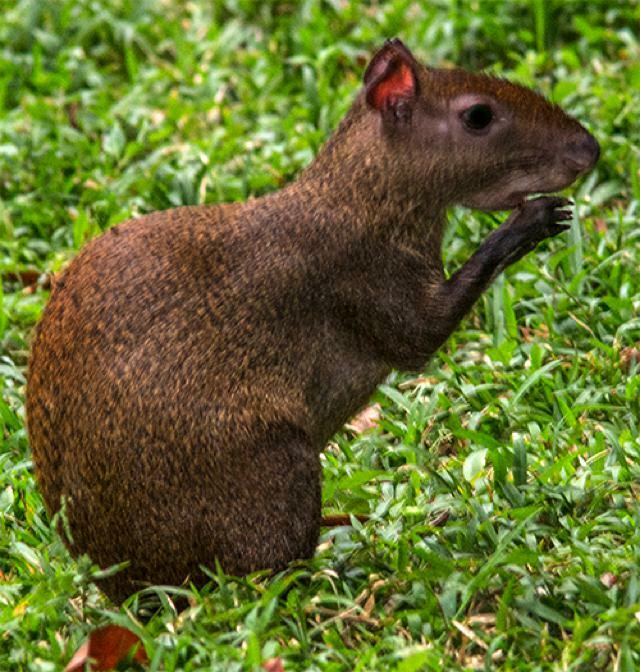 Each hair on an agouti has a series of alternating dark and light bands, giving its pelage a shimmering appearance. Having observed this Agouti convention, we bedded down for the night, serenaded by evening sounds of the forest. The Omega Group was tired from traveling but eager to rest so we could devote coming days to finding ruby-throats and seeing what natural history wonders northern Honduras had to offer. On Day Two we were up bright and early, with breakfast at 6:30 a.m. and a three-hour trail walk with Esdras beginning a half-hour later. Paths at the Lodge are all gravel--nice for walking but quite noisy for birding; they soon give way to earthen trails that quieted our footsteps. Much of what is now the Lodge at Pico Bonito is former agricultural land being returned to secondary forest. Logging occurred here, and row crops were planted and harvested for generations. 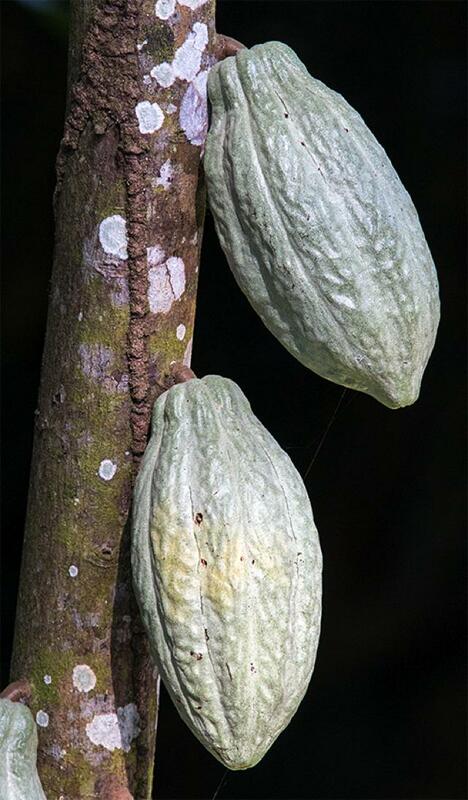 Scattered about the property are remnants of a Cacao plantation, with old trees still producing pods (above) from which cocoa is made. 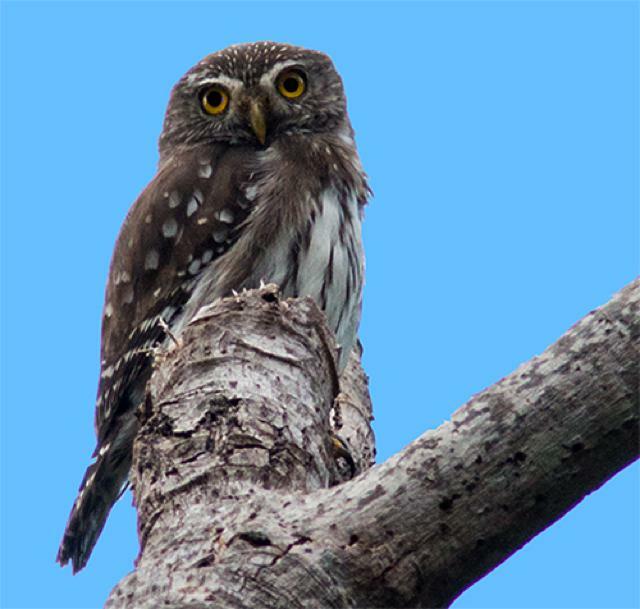 Although it was already broad daylight, one of the first birds we saw was an Ferruginous Pygmy Owl, Glaucidium brasilianum (above)--an immature with plain brown crown. 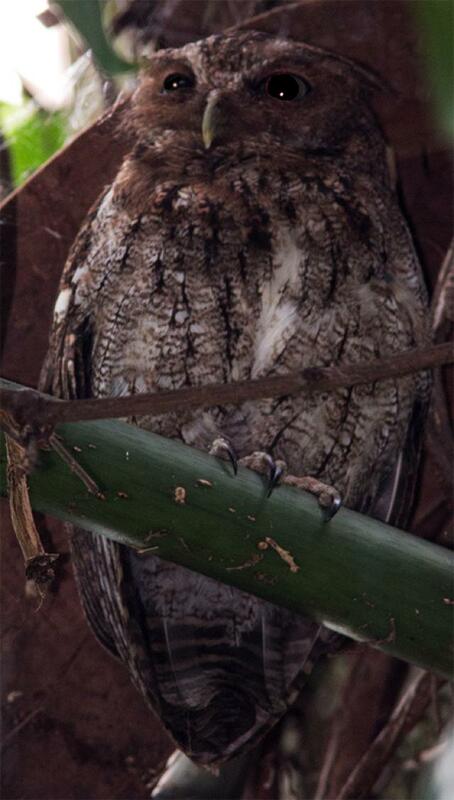 At six-inches-long, this diminutive owl is barely the size of one's palm. 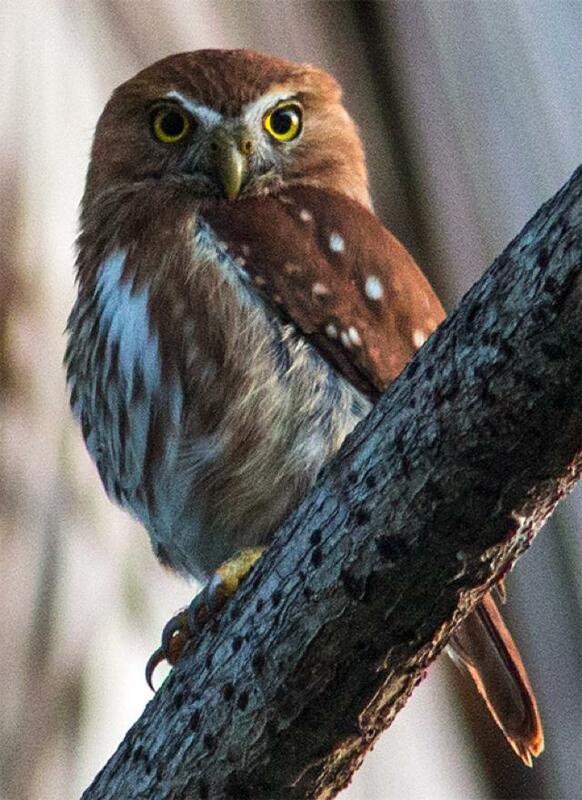 A little further along the trail was yet another Ferruginous Pygmy Owl (above)--this one an adult with streaked head. The species is primarily crepuscular (hunting at dusk and dawn) but frequently flies about in daytime when it preys upon insects and small mammals and reptiles. Despite its reputation as a bug-infested purgatory in which bird-sized mosquitoes, flies, and ticks are out to drain your body of every last drop of blood, we've found Central America has surprisingly few pests. (That said, we don't go out much at night, and most of the time wear repellent-impregnated trousers and long-sleeved shirts that minimize exposed skin.) 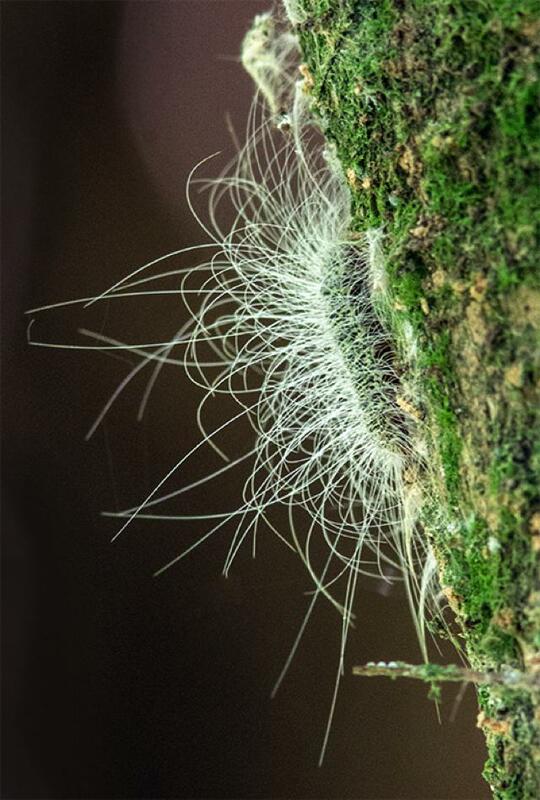 There were all sorts of invertebrates around Pico Bonito, but few of them seemed interested in making a meal of our bodily fluids. 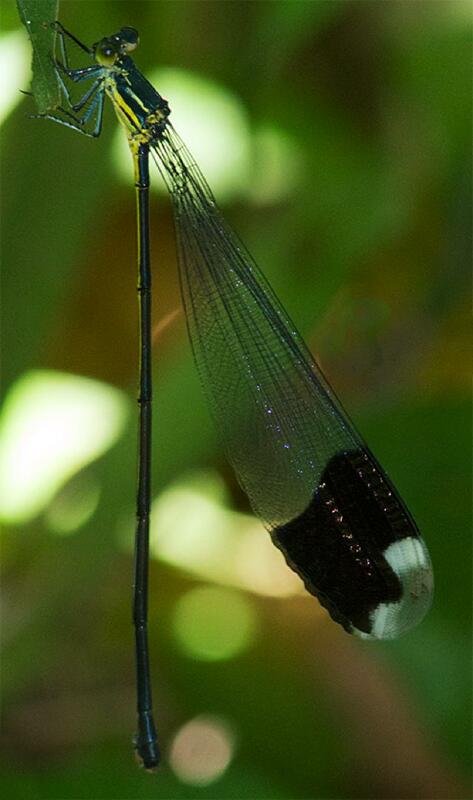 One was a large Helicopter Damselfly (above) that hung motionless from a twig, its transparent wings and silvery-green body glistening even in the dark shady forest. Members of its family (Pseudostigmatidae) lay eggs in tiny water reservoirs such as those those that form between leaves of bromeliads. 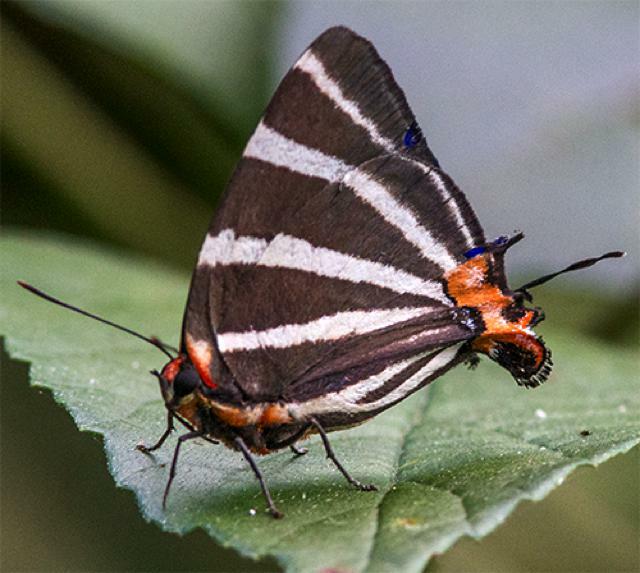 This four-inch-long species hovers at spider webs and grabs the host arachnid for lunch. Far less colorful but nonetheless fascinating was an inch-long unnamed caterpillar clinging to the trunk of a sapling. This larva avoids predators in a different way; long curving hairs--actually extensions of its exoskelton--arch over it and make it less palatable to birds and lizards. Even though we weren't besieged by pestiferous insects in Honduras, there was plenty of evidence arthropods were around. 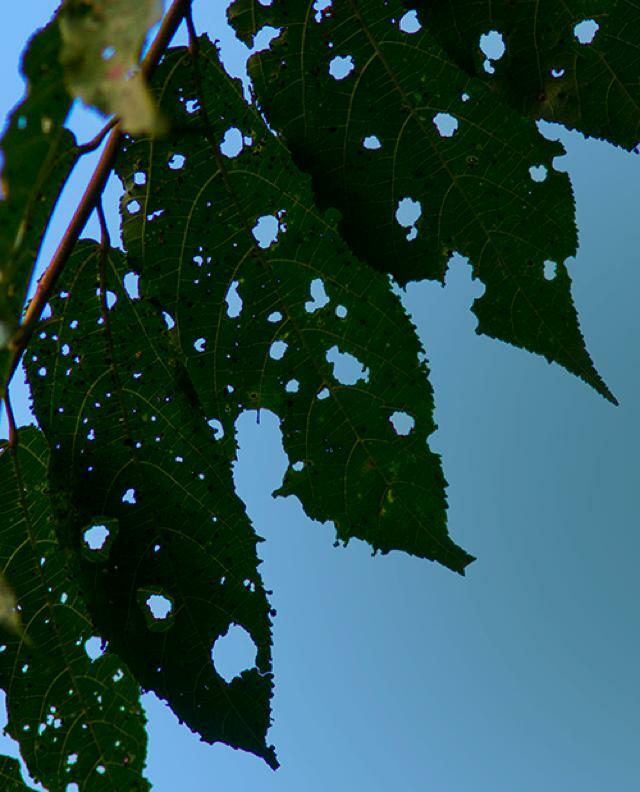 Most woody plants and herbaceous growth showed at least small signs of herbivory; the tree leaves above were riddled with holes made by ravenous insect larvae that greatly reduced photosynthetic ability. 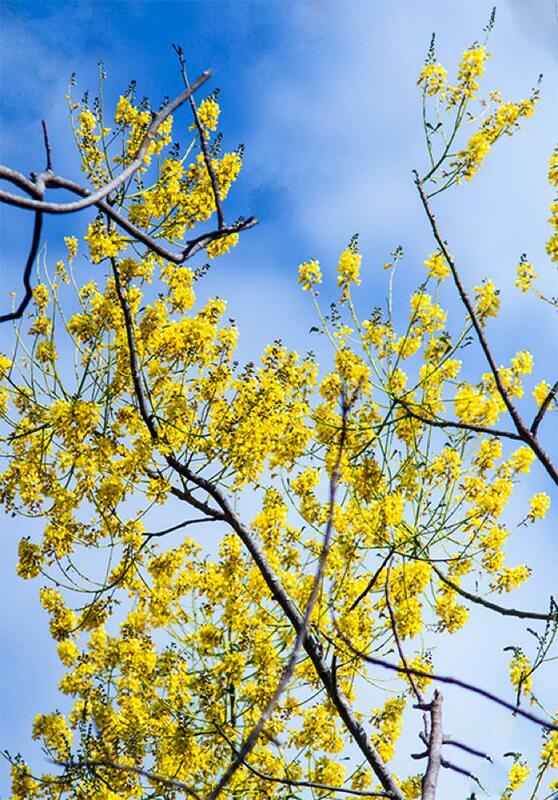 As we walked the trails we found relatively few trees in bloom--after all, it WAS late in the dry season--but two with yellow blossoms contrasted sharply against green foliage and the blue sky. 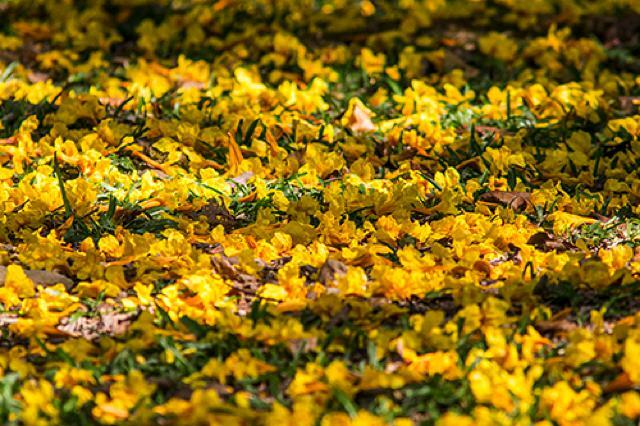 One was Yellow Poui (not pictured) with moderately abundant inflorescence, while the other (above) flowered so prolifically its small, spent blooms littered the forest floor. 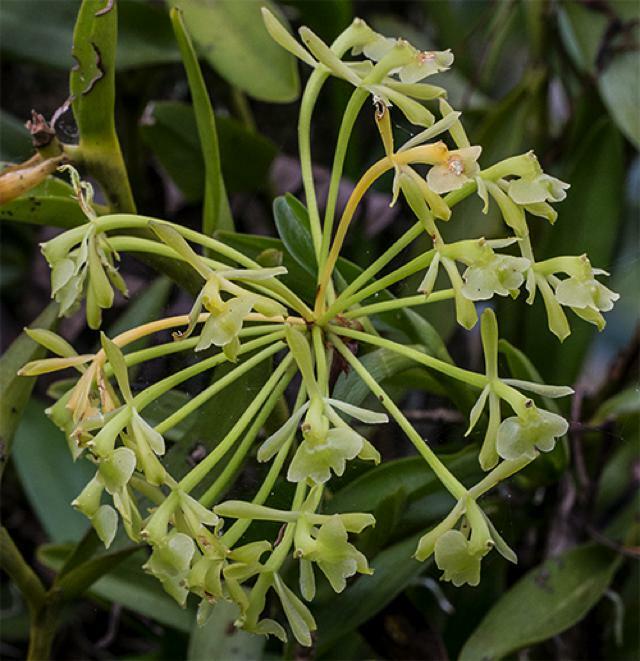 This copiously flowering plant was Brazilian Firetree, Schizolobium parahyba (above), which--unlike many tropical tree species--is completely deciduous and flowers before its leaves re-form. Its green foliage yields a compound that reportedly can be used as an antidote to venom of the Fer-de-lance and other tropical pit vipers. 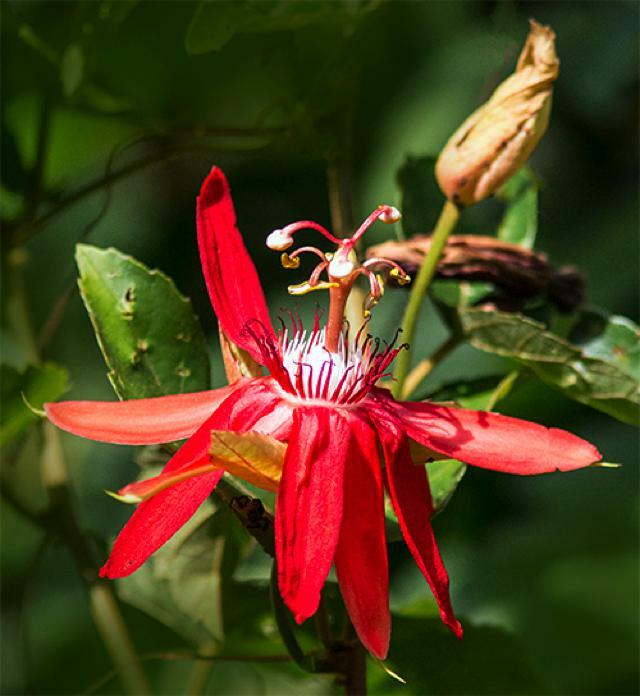 Vines with flowers are also common in the forest around the Lodge at Pico Bonito, one of the most spectacular and ornate being a Red Passionflower, Passiflora vitifolia (above). Its three-inch fruit resembles a miniature watermelon and tastes like sour strawberries. 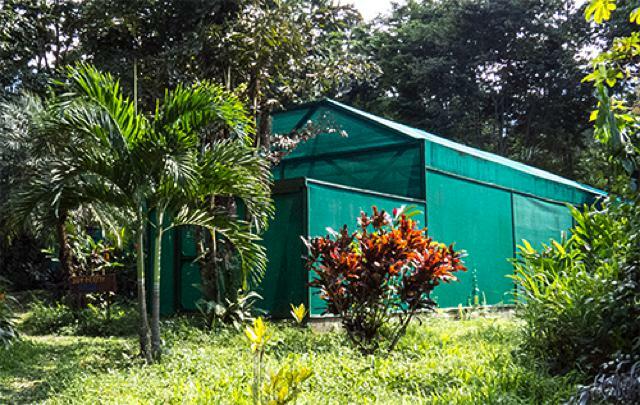 On the afternoon of Day Two Esdras took us to the Lodge's reptile facilities, including an Iguana Farm (above) where they raise and release Green Iguanas, Iguana iguana, to offset the increased loss of this creature in the region. These big lizards (below) have suffered from hunting, habitat loss, and vehicular impact as they try to cross highways traveled by speeding cars. 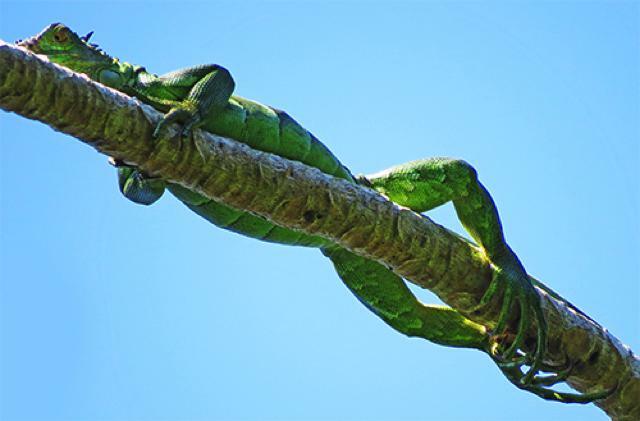 Iguanas are slow-moving and spend countless hours in the sun (above), allowing intestinal flora to break down cellulose from prodigious quantities of plant material they consume. Despite their seeming slothfulness, Green Iguanas can move very fast in short bursts, both on the ground and when going arboreal. 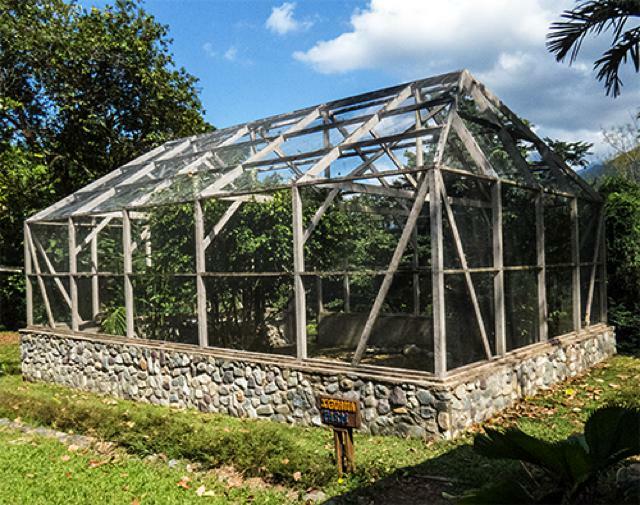 The Lodge at Pico Bonito also has a well-maintained serpentarium with snakes representative of the region. 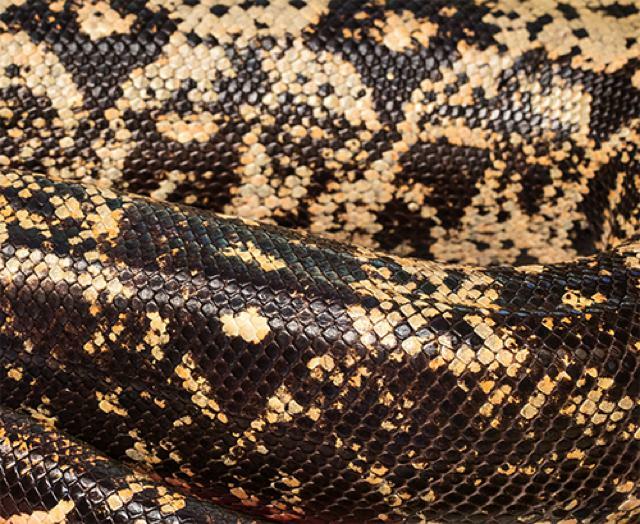 They house several Boa Constrictors, Boa constrictor imperator, with unusual coloration, including the one above whose chocolate and vanilla scales formed a particularly eye-pleasing abstract pattern. 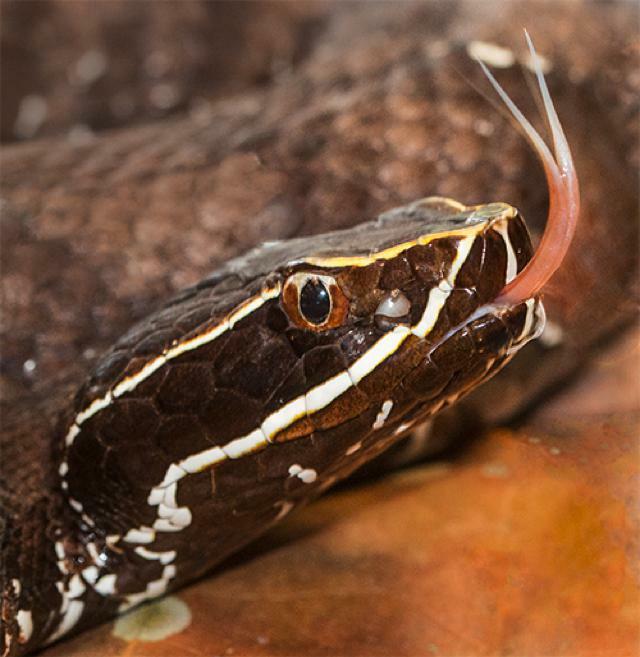 Although boas can bite, this one was digesting a large meal and wasn't particularly disturbed by our photography work when Esdras opened the cage's front panel. More dangerous to humans than the boa was a Rainforest Hognosed Viper, Porthidium nasutum (above), whose upturned snout leads to its common name. This slow-moving serpent reaches no more than two feet in length. Its hemotoxic venom alters the metabolism of prey items including small rodents that frequent the forest floor, causing them to die in a matter of minutes. The vertical pupil indicates this species is primarily nocturnal; a slit pupil apparently can open and shut further than a round one. 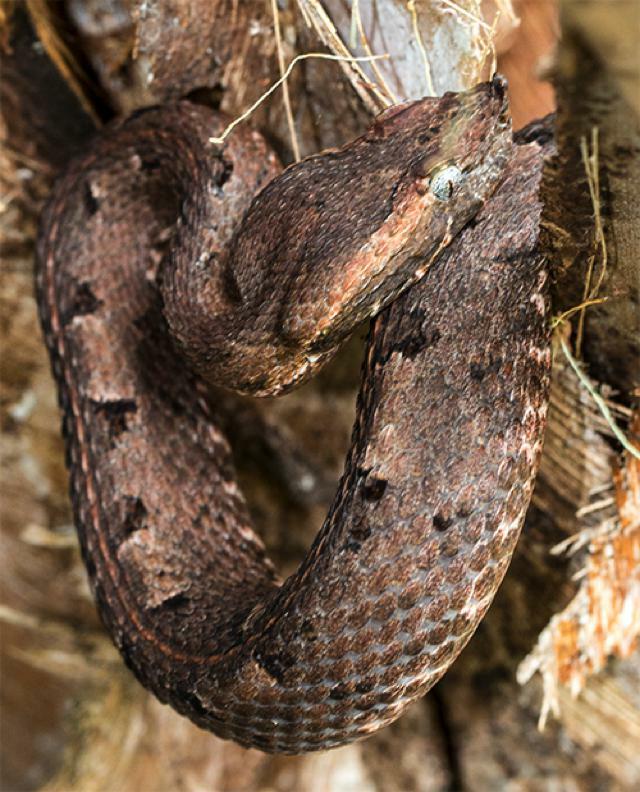 Although the Lodge's collection includes a Fer-de-lance with an unseemly reputation, the baddest snake on the block appeared to be a dark pit viper with a particularly elegant face. It was a Mexican Moccasin, Agkistrodon bilineatus howardgloydi (above)--known locally as a Cantil--that never took its eyes off us or the camera and constantly flicked its tongue to sample the air for trouble. We had to photograph this aggressive individual through the glass of its cage, lest it strike and inflict potentially fatal damage. The two-foot-long species is closely related to the much larger Cottonmouth (Water Moccasin) of the southeastern U.S. Its venom is highly hemotoxic and kills prey almost immediately. Of all the serpents, our favorite was the Brown Vine Snake, Oxybelis aeneus (above), whose extremely slender configuration does indeed make it resemble a vine. 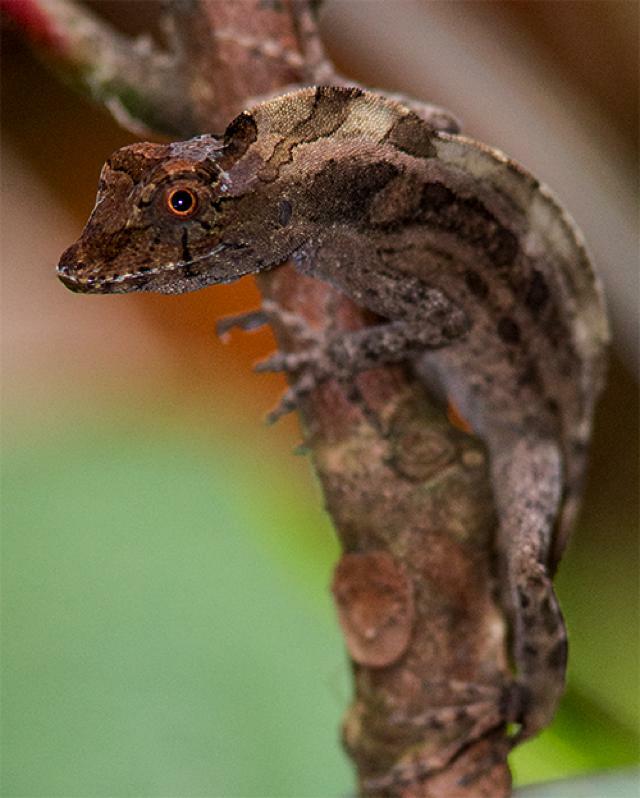 These reptiles extend their bodies and remain motionless for long periods of time, enabling them to wait for big insects and small birds--including hummers--to meander past. Quick as lighting the Brown Vine Snake strikes out, grabs prey items with its wide mouth and recurved teeth, and somehow manages to swallow unsuspecting animals despite the narrowness of its neck. 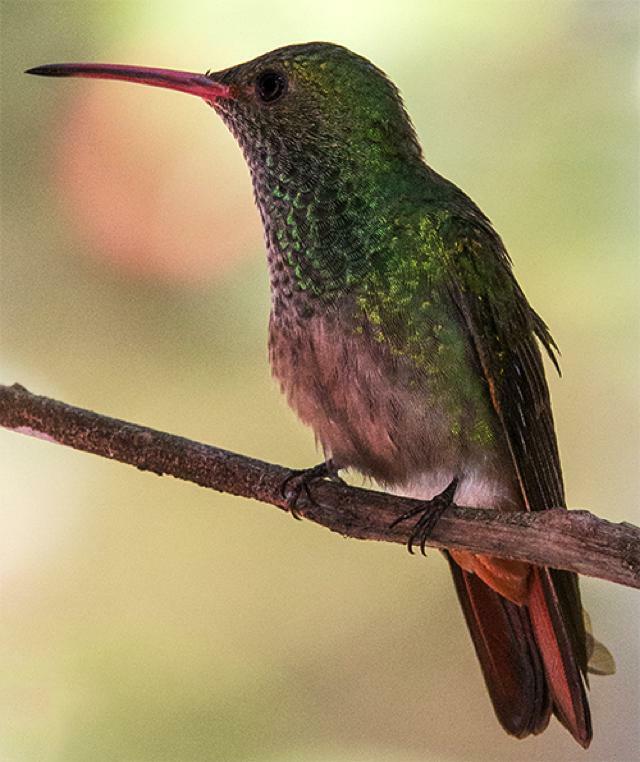 During our e-mail communications with James Adams of Pico Bonito, he mentioned his guides reported Ruby-throated Hummingbirds visiting feeders at another nearby facility called Rio Santiago. Eager to find our target species, the Omega Group and Esdras took an exploratory trip to this location, about an hour away and situated--you guessed it--on the Rio Santiago (above). The river is a major source of water for the area and at least on weekends provides a recreational site when local folks come out to picnic and swim. Water in this major tributary was surprisingly clean--so much so we could see lots of small fish setting up territories among the rocks at its edge. 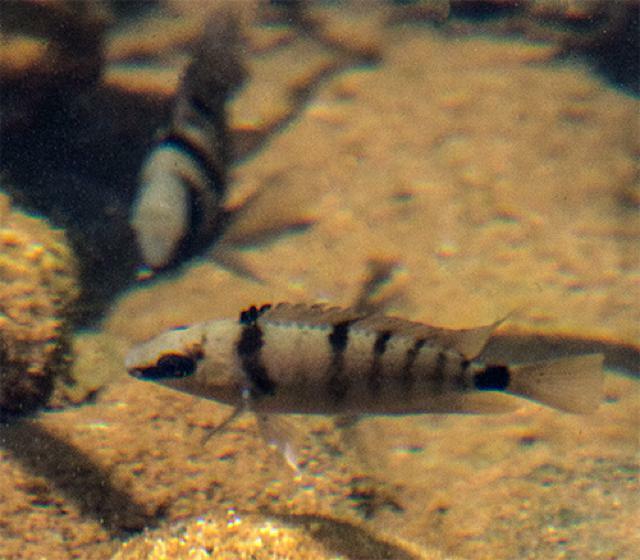 Particularly noticeable were dozens of what we believe were Blue-eyed Cichlids, Archocentrus spilurum (above), with black vertical stripes and eye line contrasted with a pale body. This species is quite popular among freshwater aquarists in the U.S. and Europe. Rio Santiago Lodge, accessible by a very bumpy dirt road, opened just a few years ago and is still under development. It includes a few cabins, a pool, and outdoor dining areas--one of which (above) provided a spot from which to observe. Settling down at a table, we quickly understood why this might be a good place to find a Ruby-throated Hummingbird in northern Honduras. In front of us was an interesting panorama that included at least 150 little hummingbird feeders about six inches long--EACH of which are filled at least twice daily by lodge workers. 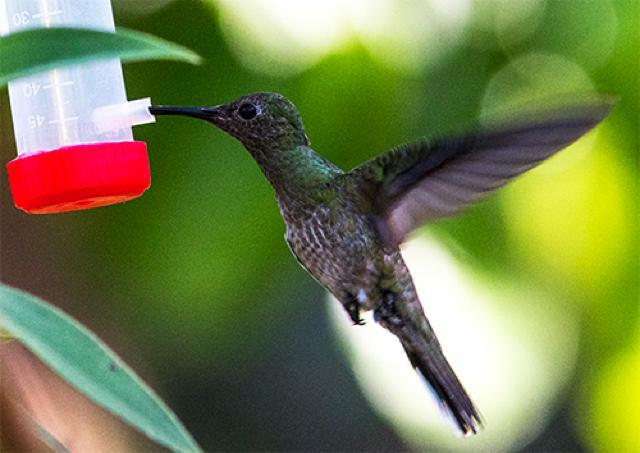 (This is NOT a task or set-up we recommend for the average hummer enthusiast back in the U.S.) One flowering shrub in particular (above) supported fifty feeders that, in turn, attracted numerous hummingbirds of multiple species. Also taking sugar water from the plethora of feeders were numerous large-ish hummers with green backs and speckled iridescent green throats and chests (above). 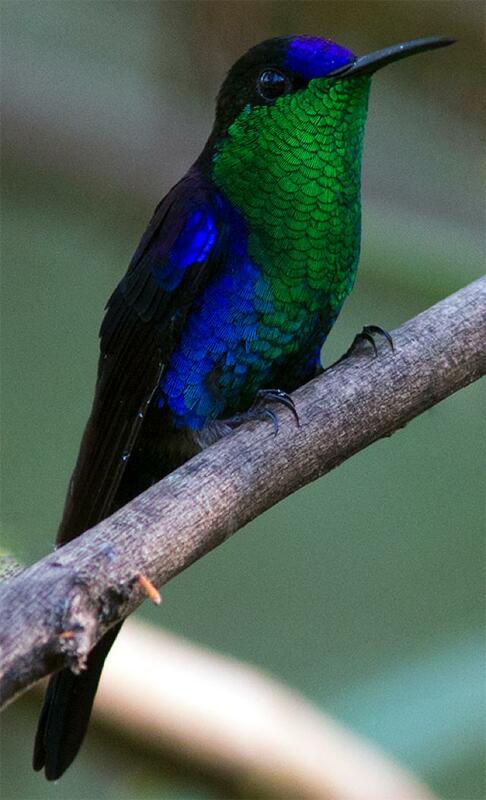 First-time visitors to the tropics are often surprised to learn these are female White-necked Jacobins, Florisuga mellivora, which look about as different as possible from their mates. 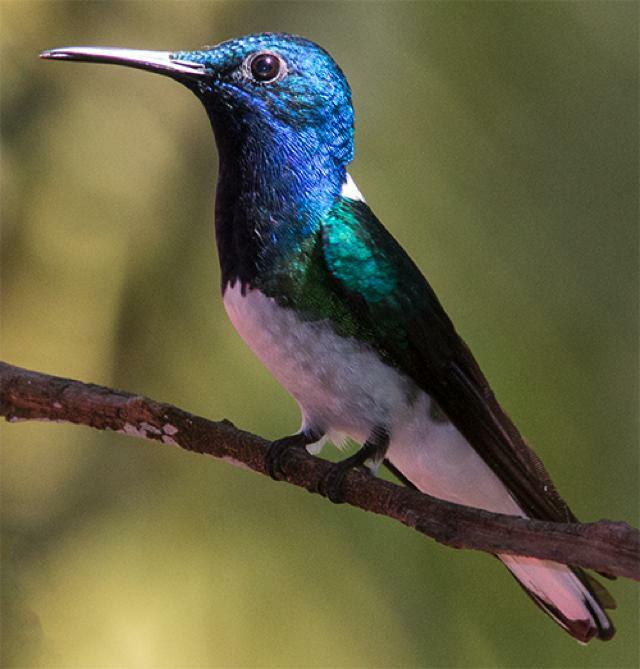 To illustrate this point, the photo above is an adult male White-necked Jacobin, which we've always thought of as the penguin of the hummingbird world. Nicely attired in formal plumage of green, blue, and pristine white, this big hummer has a heavy but relatively short bill. The terms "Jacobin" is used for this species because its outfit is reminiscent of black and white vestments, hoods, and cloaks of Jacobin friars. Another hummer we were able to photograph at Rio Santiago was one we've seen on all our Central American study sites: Rufous-tailed Hummingbird, Amazilia tzacatl (above). This abundant species is about as adaptable and opportunistic in the Neotropics as Ruby-throated Hummingbirds are on their North American breeding grounds. They're also very aggressive and often drive away much larger hummers. And speaking of Ruby-throated Hummingbirds, during four hours of feeder watching at Rio Santiago we saw exactly none, although the owner's wife showed us a nice photo of an adult male RTHU she took there last March. She said there had been no ruby-throats at Rio Santiago in the current non-breeding season of 2013-14, so that news pretty much ruled out the site as a place to conduct future research. After a morning at Rio Santiago that was both productive AND disappointing we headed back to Pico Bonito for lunch and a tour of the Lodge's Butterfly House (above). 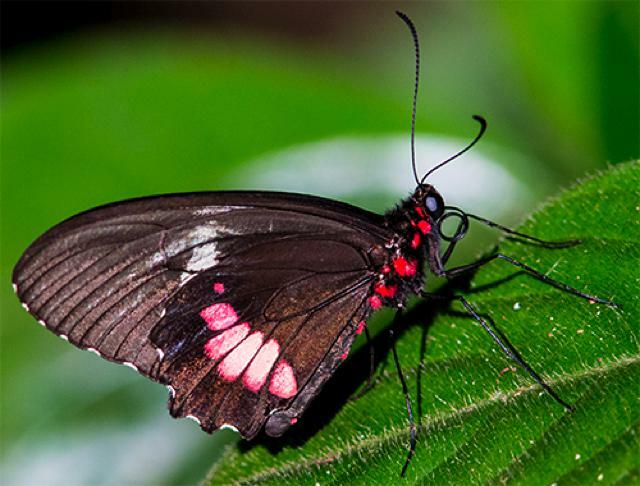 On a regular basis, staff members go out and collect free-flying butterflies and transfer them to the enclosure. There the insects find appropriate host plants on which to lay eggs and on which larvae can feed after hatching. 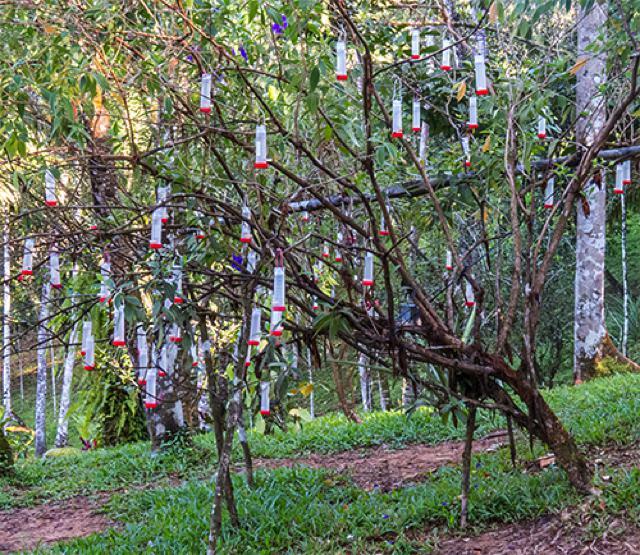 On our fourth day at Pico Bonito we opted for a pre-dawn walk up the trail to the 50-foot tall "Toucan Tower." Overlooking a small gorge chiseled out by Rio Coloradito, this was a great place to watch the sunrise and listen for a dawn chorus of birds and insects. Esdras (above left) and Ernesto trained spotting scope, iPhone camera, and telephoto-capable Canon SX50 on distant trees. 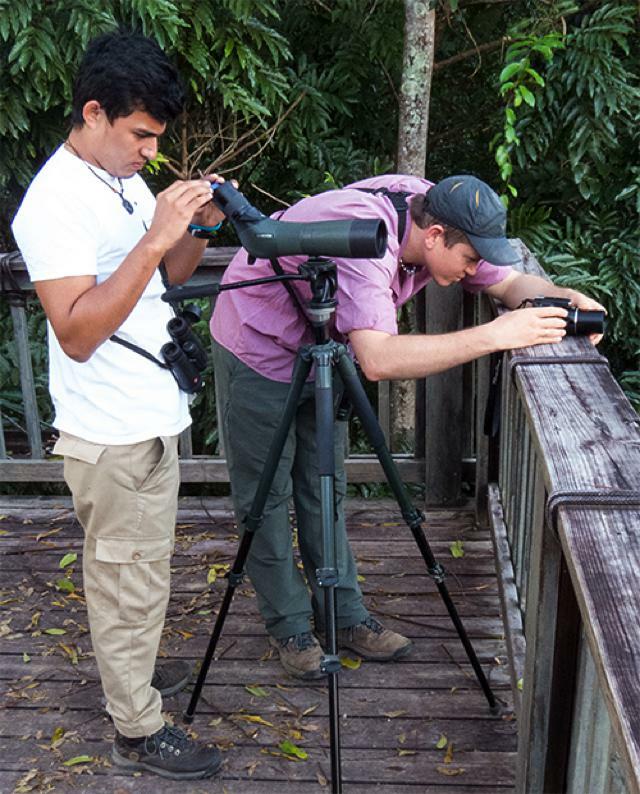 They were attempting to find an avian forest resident that is one big reason birders like to come to the Lodge at Pico Bonito. 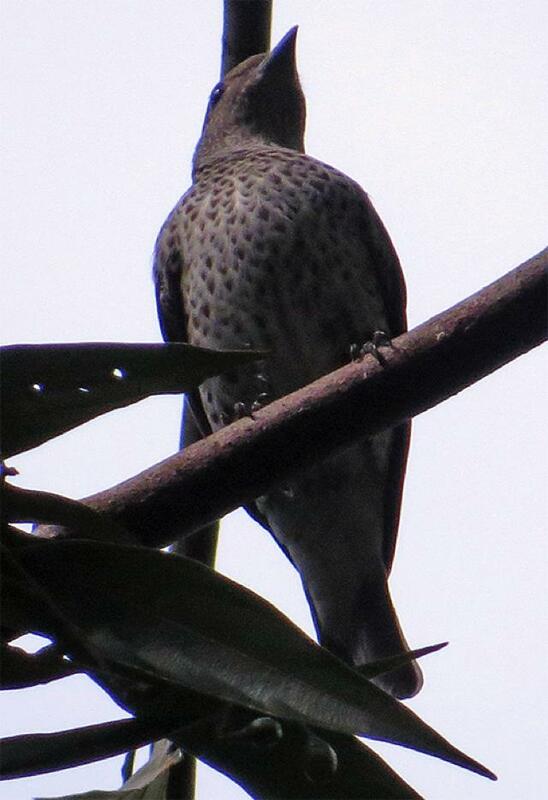 Sure enough, across the gorge and high in a canopy tree the observant duo eventually located a tiny blue speck that could only be the passerine species they sought: Lovely Cotinga, Cotinga amabilis. 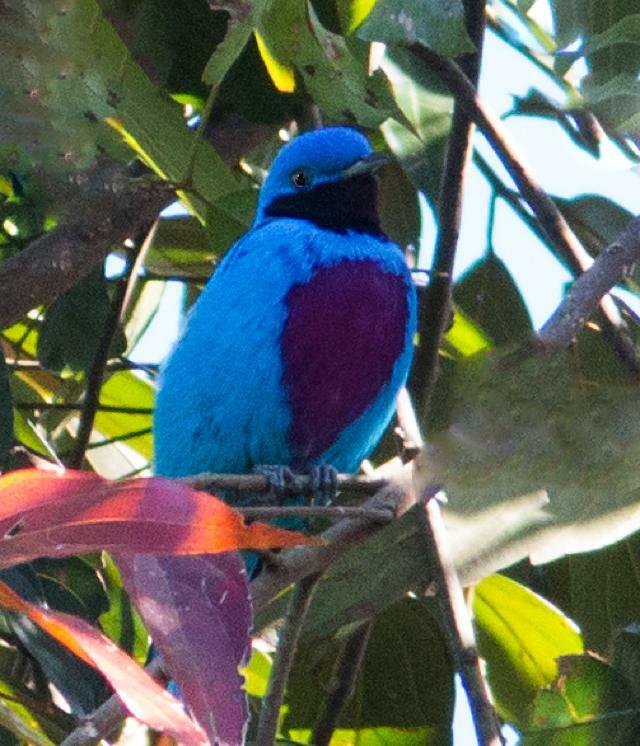 Lovely Cotinga males (above) are breathtaking birds whose colors nearly defy description. A background of turquoise contrasts sharply with--in this bird at least--a nearly heart-shaped splotch of red-violet on the chest and belly. The throat matches the chest but, as above, usually appears darker in photos. By comparison, female Lovely Cotingas (above) are the epitome of drab, being dark brown above and heavily scaled in white; the belly is whitish with brown spots. At Pico Bonito we observed several male and female Lovely Cotingas--most too high in the trees for really sharp photos. 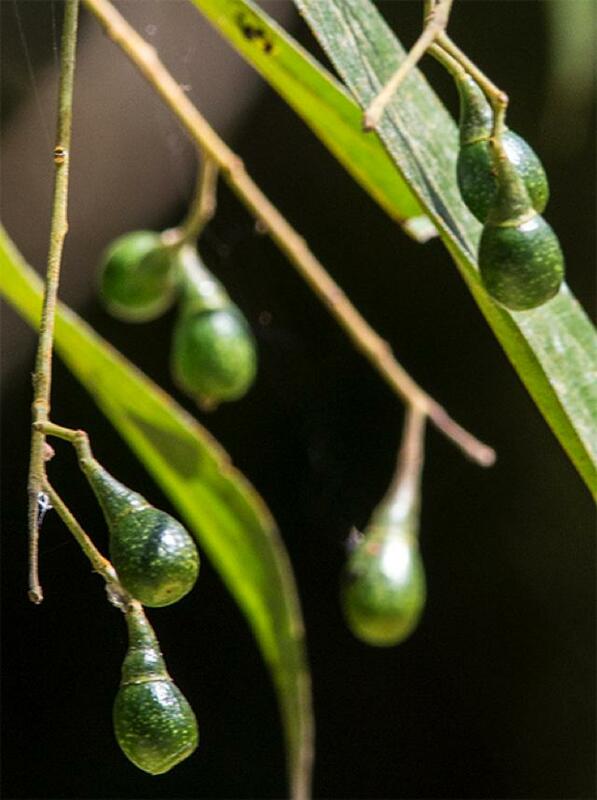 At this time of year, those canopy-foraging contingas were after one particular food item: The quarter-inch fruit of Wild Avocado, Persea americana (above). Although unripe, these fruits apparently are relished by Lovely Cotingas and numerous other birds; in fact, if you live where the weather allows the tree to flourish, planting a Wild Avocado in your yard might yield more species than putting out bird seed! 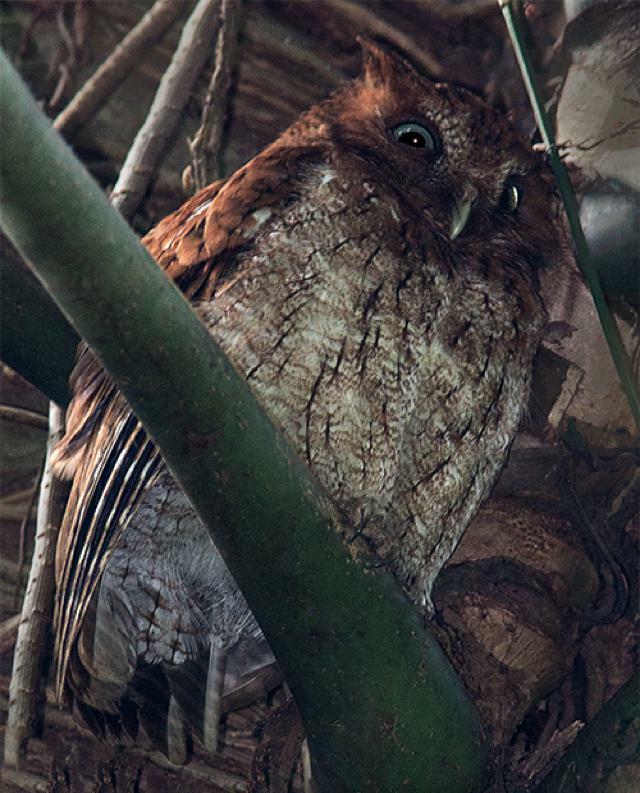 Easier to reach by camera than the cotingas were a couple of Vermiculated Screech-Owls, Megascops vermiculatus, day-roosting in a palm along the trail. One (above) was a gray phase individual who squinted at us in the daylight. 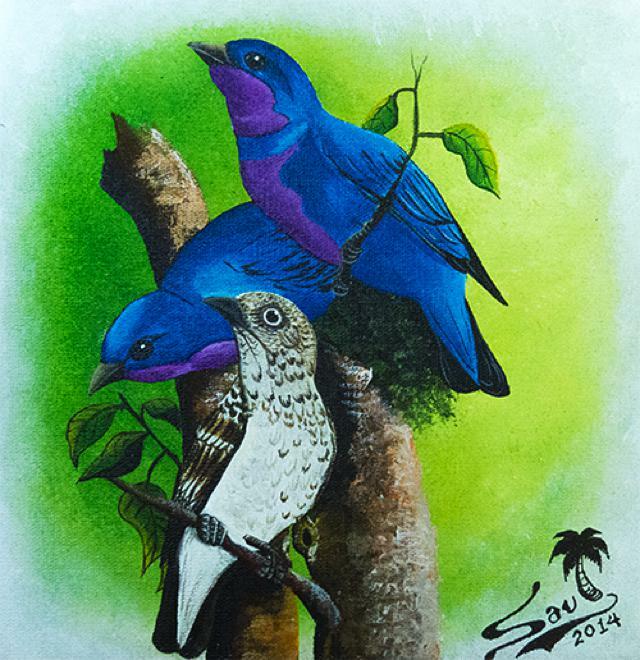 Although Honduras hosts plenty of passerines (AKA "perching birds"), the country is also home to entire bird families that have few or no representatives in the U.S. or Canada. 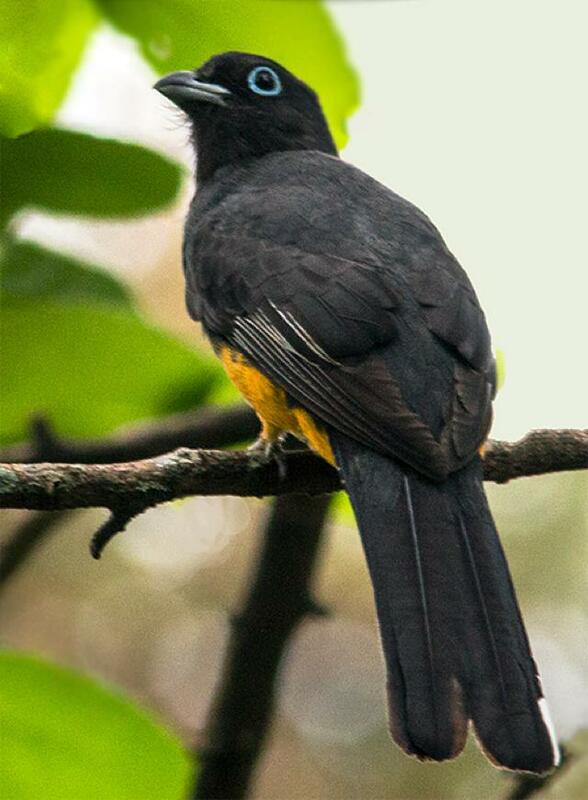 One of those is Black-headed Trogon, Trogon melanocephalus (above), a member of the tropical Trogonidae. We always seem to find this bird with its back to us--unfortunate because its belly (partly visible in the photo) is brilliant yellow. Also note the trogon's fleshy blue eye ring. 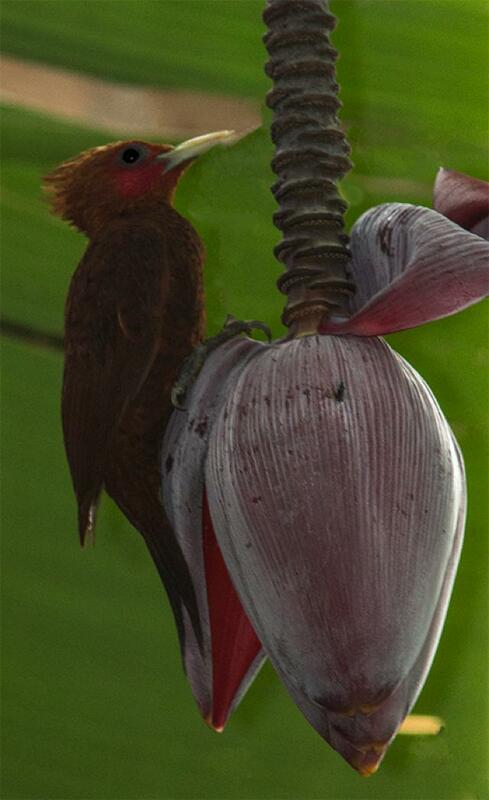 Another tropical bird whose family DOES have representation across North America is the Chestnut-colored Woodpecker, Celeus castaneus, posing above on a banana flower. Although it is in the same family (Picidae) as our familiar Red-bellied and Downy Woodpeckers, the Chestnut-colored Woodpecker is totally devoid of any black or white coloration or ladder-like markings. Males (above) have a much redder cheek patch than their mates. Owls and contingas and trogons and woodpeckers were all fine to look at, but they're NOT Ruby-throated Hummingbirds. After seeing no RTHU at the feeders at Pico Bonito or Rio Santiago, we were beginning to think they were absent from this part of Honduras OR that we had missed a local population already on its way back north to breeding grounds. 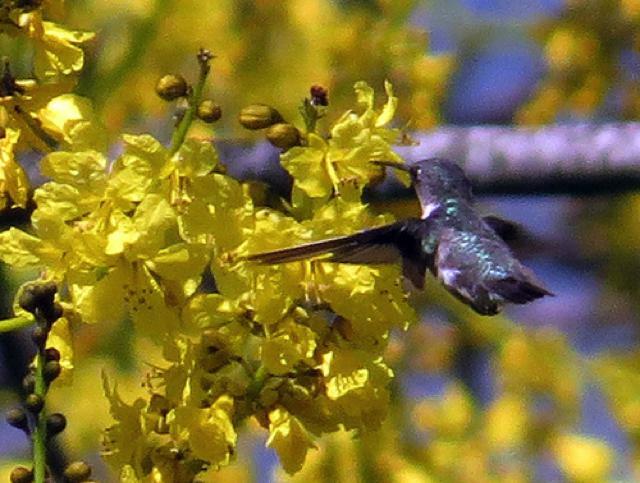 It was with some relief that Ernesto and Esdras finally spotted a ruby-throat (above) feeding on yellow flowers of a Brazilian Firetree. From behind we could see the bird was in wing molt, with left primary #8 grown in about halfway. When the bird perched and turned, we got a lot more data: A single red gorget feather meant this was an immature male who needed to develop a full red throat before migrating. This bird also had heavy throat streaking typical of most young male RTHU. 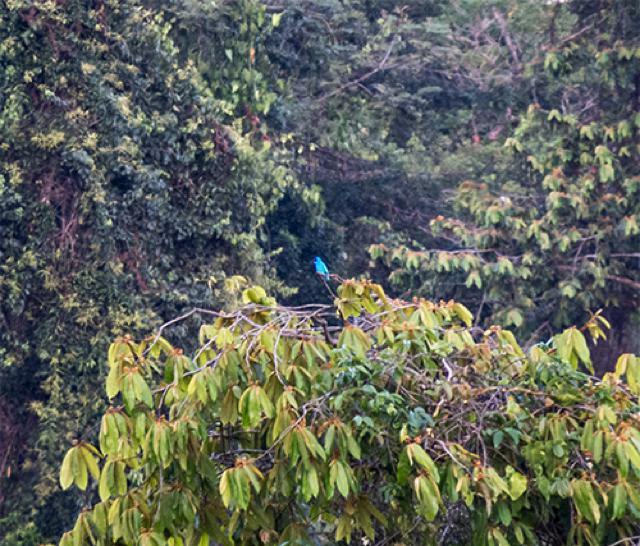 This solitary bird constituted our only Honduran sighting to date of our target species. Having finally seen a Ruby-throated Hummingbird in Honduras, Esdras took us back down the mountain from Pico Bonito to his hometown of La Pina--"The Pine." (The Honduran or Caribbean Pine, Pinus caribaea, is the country's national tree.) 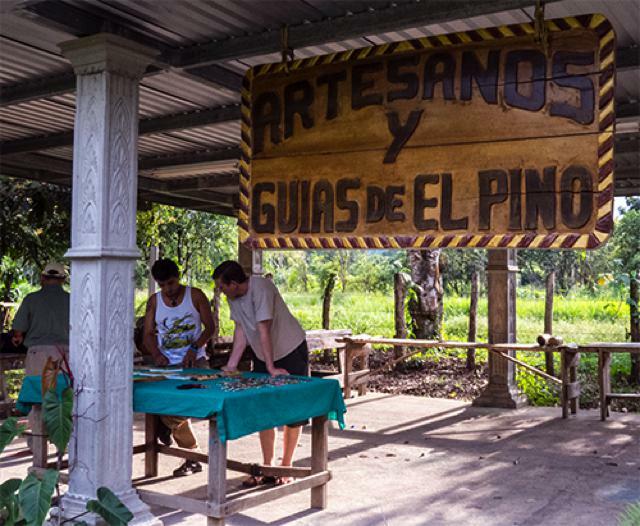 At La Pina Esdras escorted us to the Artisans & Guides Community Center, where locals gather to ply their trade. Esdras actually got his start as a guide through this facility. Each afternoon residents from surrounding communities gather to make artwork of various sorts, from coconut shell key-chains and necklaces to nice-quality paintings on canvas. 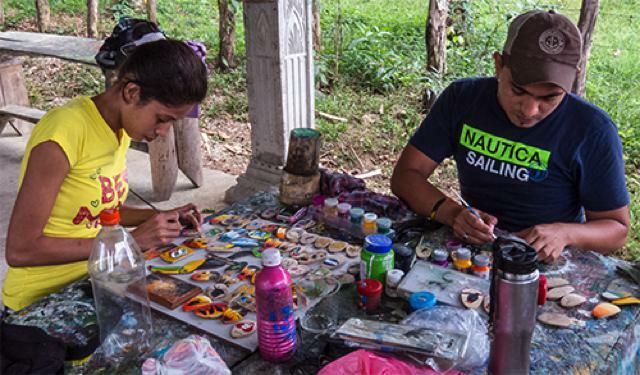 In the photo above, Yanela Romero and Saul Cordoza put the finishing touches on their work, sold to co-op visitors and through local lodges and stores. A percentage of the profits goes back into the non-governmental co-op to purchase supplies and pay for maintenance and operation of the facility. Saul is on-site manager of the co-op and can be found there most days painting and advising younger painters. For a mere ten dollars we purchased his reproduction painting (above) of a 1856 rendering of Lovely Cotingas by German artist Joseph Wolf. It will make a nice remembrance of our trip to Honduras. Back at the Lodge we examined another example of indigenous artwork--several shelves of traditional pottery (above) produced by Lenca Indians. This very attractive claywork uses four colors of clay dug from different locales, formed by artisans, and fired and polished at least a few times to acquire the desired effect. The skill and creativity and story behind these pieces reminded us very much of the Catawba Indian pottery in our permanent collection back home at Hilton Pond Center. 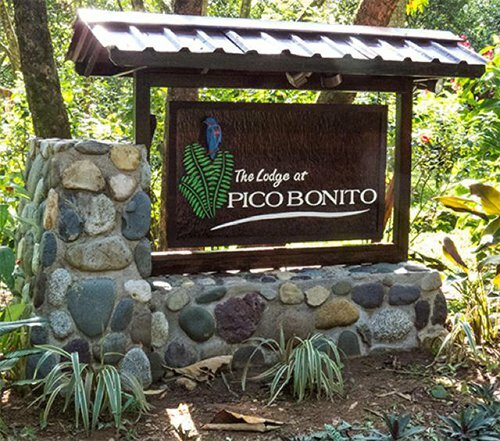 POSTSCRIPT: Our first four days in Honduras--based out of the Lodge at Pico Bonito thanks to the hospitality of James Adams--were enjoyable and informative. 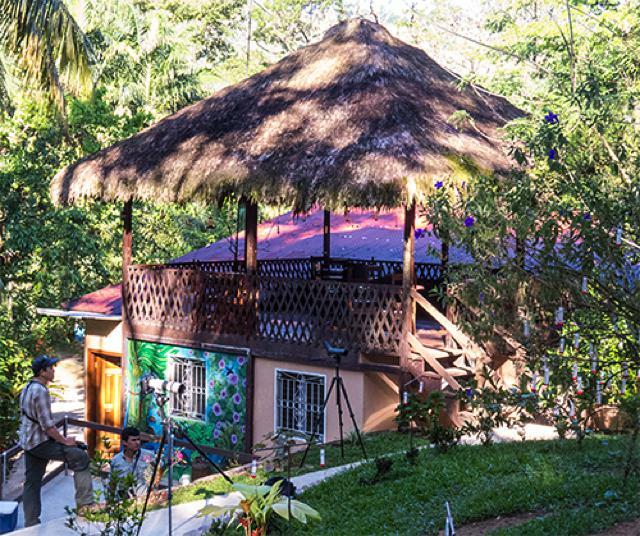 We had time to experience the Lodge's amenities and explore a few nearby natural areas as we searched for appropriate Honduran locales to expand our ground-breaking Neotropical research on Ruby-throated Hummingbirds. Those four days were quite busy, but we knew there was plenty more to see and that we had five MORE days to search further. That subsequent time will be the focus of our next regular installment of "This Week at Hilton Pond." 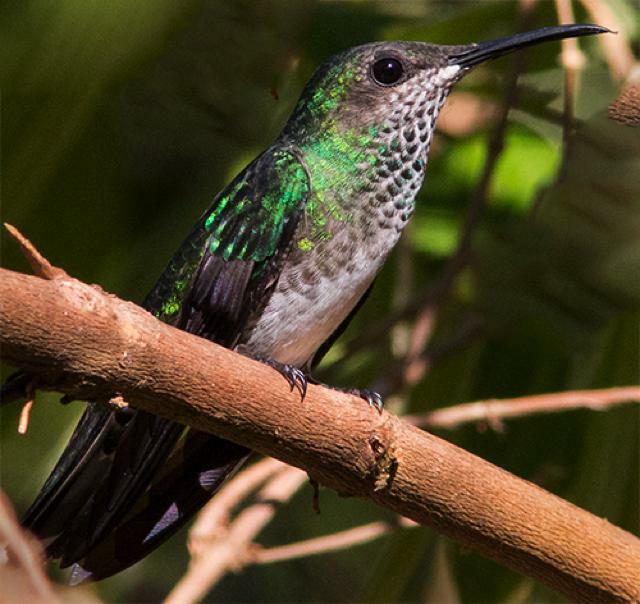 Please check back later for further news and photos in "Hummingbirds In Honduras: Ruby-throats Or Not? (Part 2.)" 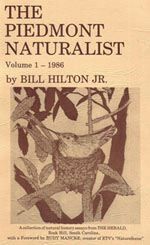 "This Week at Hilton Pond" is written and photographed by Dr. Bill Hilton Jr., executive director of Hilton Pond Center for Piedmont Natural History. We're pleased that folks were thinking about the work of the Center and making end-of-year contributions that were fully deductible on 2013 income tax returns. Please join them in 2014 if you can via PayPal, Network for Good, or personal check (c/o 1432 DeVinney Road, York SC 29745). If you like shopping on-line please become a member of iGive, through which 1,500+ on-line stores from Amazon to Lands' End and even iTunes donate a percentage of your purchase price to support Hilton Pond Center. Every new member who registers with iGive and makes a purchase through them earns an ADDITIONAL $5 for the Center. You can even do Web searches through iGive and earn a penny per search--sometimes TWO--for the cause! Please enroll by going to the iGive Web site. It's a painless, important way for YOU to support our on-going work in conservation, education, and research. Add the iGive Toolbar to your browser and register Operation RubyThroat as your preferred charity to make it even easier to help Hilton Pond Center when you shop. --A weekly banding total of 135 birds is pretty good for Hilton Pond Center (see list at left)--but it was less than half what we did last week when the snow brought birds to the feeders (and traps). American Goldfinches are our most numerous species by far (339 bandings out of 541 in 2014), but Chipping Sparrows--which usually don't show up in good numbers until well in March--are doing pretty well with 109 banded. --Purple Finches are finally starting to drift in, quite a bit later than their usual arrival dates. (Some years they come as early as late November, others in January--probably depending on availability of winter food in Canada.) With only ten banded this winter through 24 Feb we we won't come anywhere close to average (244 bandings), much less reach our record-breaking winter of 2003-4 when we banded a whopping 1,055 PUFI. 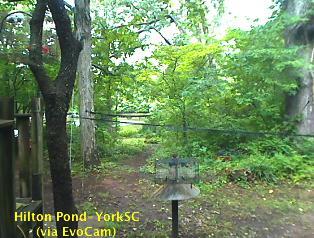 --As of 15 Feb Hilton Pond Center's 2014 Yard List stands at 40--about 23% of the 171 avian species encountered locally since 1982. No new birds were seen this week. --The immediate past installment of "This Week at Hilton Pond" dealt with a recent Piedmont snow and recognition of our 60,000th bird banded at the Center since 1982. The write-up is archived and always available on the Center's Web site as Installment #591.